What is this Tiny Brown Bug with Pinchers? By Chris Williams on February 15, 2013. I recently saw this tiny brown bug with pincers walking on the ceiling in my bedroom. What is it? It sounds like a pseudoscorpion. The first thing you might be thinking is eek! Scorpion! Danger! Not to worry, but I agree with those sentiments about real scorpions and am quite happy they’re not up here in the Northeast. I have a friend who moved to AZ because she hated the cold and on a return visit to NH gave me a little paperweight with a scorpion inside it. I thought that was a very good place for the scorpion being embedded in plastic! Cold vs. scorpions, am I missing something? Anyway, the pseudoscorpion is not an insect but, an arachnid, and more closely related to scorpions, spiders and mites. They are predaceous by nature and feed on small insects and other arthropods. Like spiders and true scorpions, the pseudoscorpion employs venom to subdue its’ prey, but without the use of fangs or a stinger. Instead, the venom glands are housed within the pincers (which are really highly modified mouthparts). Venom quickly immobilizes the prey while digestive enzymes are pumped in. Liquefied contents are then ‘sucked’ back out leaving an empty shell similar to the way spiders feed. Despite being ‘venomous’, because of their small size at less than 5mm, pseudoscorpions are not harmful. Outdoors, they live mostly unnoticed, under stones, or in leaf litter. When they do rarely come inside, I tend to notice them on ceilings or along baseboards. 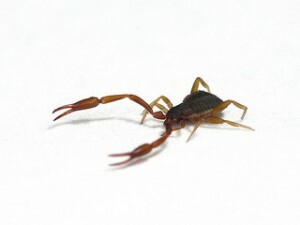 Peudoscorpions are an occasional invader and while there are usually never enough of them inside to require special control measures, Colonial’s proven semi-annual service is a prescription for keeping them out.